Burger King’s mission statement is simple and to the point: To offer reasonably priced quality food, served quickly in attractive, clean surroundings. Their marketing supports this by enticing customers with plenty of reminders of featured food offerings and competitive prices. They use signage to guide the customer from the parking lot to the drive-thru and into the store. Their most effective tactic is mouth-watering food photography. According to The Motley Fool, Burger King’s strategy is to not launch as many products as its rivals but to make “a big deal” out of each launch. “We continue to launch fewer and more impactful products and maintain a balanced approach on menu and marketing,” CEO Daniel Schwartz reiterated on the company’s August 2016 earnings call. Food photography takes center stage in all of their marketing signage that is strategically placed throughout the property on flags, standees, window banners, menu board callouts and wall posters. Even the napkin holder acts as a reminder. 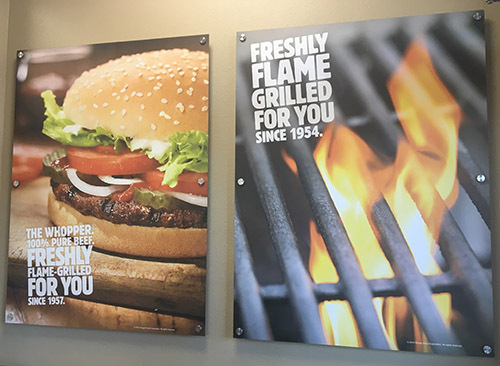 The signage is used to showcase new items or promotions, such as the recent 2 for $10 Whopper meal. Three of the company’s biggest product introductions last year were a hotdog, a burger-burrito mashup called the Whopperito and the very successful Mac n’ Cheetos. Like Wendy’s, they also retire and bring back popular menu items, such as their Cheesy Tots.